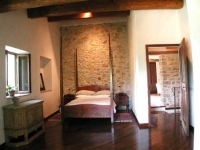 Refurbish stone villa built on the site of a Roman fort with wide views over lake and mountains. 4 double bedrooms, 1 twin bedded room, 2 bathrooms, 1 shower room, kitchen/dining, upper and lower terraces. Local supermarket 5 mins. Main shopping town, with bank, hospital etc. 15 mins. Many excellent restaurants. Local markets to buy home produce. Fascinating old hilltop villages to explore and Florence, Siena, Assisi etc. only 1.5 hrs. away.